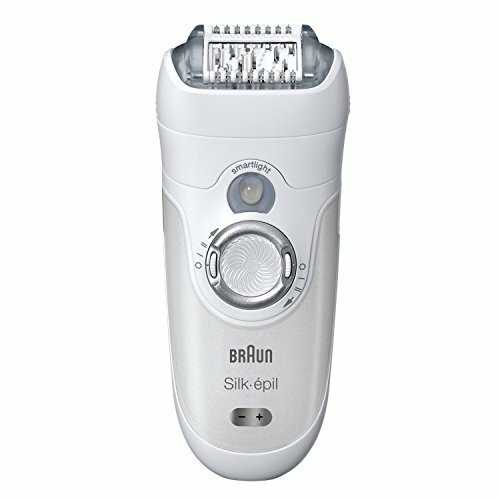 Next up we have another, slightly more recent model from the Braun Silk Epil range the Silk Epil 7. The Silk Epil 7 is in many ways like the dad of the Silk Epil 3, it retains many of the same features, with a few handy upgrades too. The most significant change though is perhaps the jump in size. While the Silk Epil 3 is a very micro sized epilator, the Silk Epil 7 is larger and somewhat more powerful, and faster as a result. Keep reading out Braun Silk Epil 7 SE7681 review to find out more about the differences. One of the handiest features which make the Silk Epil 7 stand out is the compatibility for wet use making this one suitable for in the shower use. Bear in mind this does also give added lubrication, and can make the overall experience a little easier, and somewhat less painful. Finally, it also makes the cleaning routine easier and a little less frequent. The bigger design gives room for twice as much tweezing as with the Silk Epil 3, making this model Braun’s most efficient with 40 close grip tweezers. Also unlike its predecessor, this particular model does come ready for cordless use, giving you the option and freedom and flexibility to move around, and use your Epilator on the go. 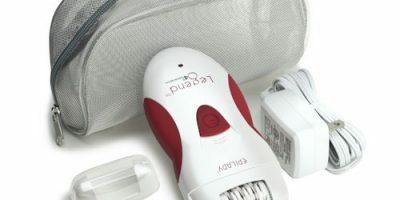 The features that the silk Epil 7 retains from the 3 include the same smart soft lift tips (albeit more of them), the handy led light for illumination, and the same two-speed options for gentle or high efficient epilation. As we’ve mentioned, the design comes in a little larger than the previous model, though it’s still built with a comfortable easy to use, ergonomic design. The sides are curved inward toward the bottom to fit perfectly in the hand, and the sides are covered in smart grip material to avoid any accidental drops. A new addition to the design of this model is the rotating head feature, new to this design. The head can pivot 15 degrees in either direction, which in addition to the curved shape of the head makes for a smooth cruise over the contours of your body. As you Epilate the rollers at either side of the head provide a high-frequency massage as it glides over the skin. This stimulates the hair and makes hairs more easily accessible, plus it eases the pull, reducing any associated pains. Again this is another model whose popularity is certainly helped by the all-around usefulness of the device. It isn’t one part of the body specific, and attachments are included to ensure that if you do invest in this model, that you won’t need any others to cater to your epilating needs. These are perfectly suited to any unwanted hair growth from head to toe. Many of the features already covered explain a little about the technology that goes into this model, here are a few more key details that are useful to know too. The battery on this model is well above the standard of basic cordless models and after one hour of charge you’re ready and set for up to 30 minutes of use at full power. The close grip technology that goes into the development of this model allows for grip closer to the skin, making it effective for epilating shorter hairs than ever, suitable for hairs of only half a millimeter in length. Also the waterproof casing is perfect for toning the unpleasant feeling even more by using it submerged beneath your bath water. An automatic mechanism will turn the power of the device off immediately in case you get it wet whilst plugged in, which is a really important safety feature. The device is compatible with fine to coarse hair, and if you are using it for hair around the bikini line (which is often more thick and coarse) then it’s also clinically proven to grow back thinner and finer after using epilation on the area. The Epilator comes complete with a small handful of accessories to ensure easy and comfortable use for all over the body use. Complete in the box with the epilation device are a handful of helpful accessories to ensure the best performance, whatever you’re using them for. You’ll receive: one standard shaver head, ideal for the legs; a trimmer cap for tidying up smaller areas of hair; a sensitive area cap which is recommended for use beneath your armpit, and around your bikini lines too; a facial cap for the face, especially for the top lip; and an efficiency cap which you would use on larger less sensitive areas like the bottom of the legs. You’ll also find wipes included, these are for pre-epilation and help to clean and prep the skin before use. Finally, a handy carry pouch is thrown in, ideal for both storage and traveling. Many of these points might well be more a matter of personal preference, rather than being objective disadvantages, the larger size, for example, might well not suit many users, as well as the mini version, does. Also, the price point does definitely come in a little higher than it’s predecessor, though it isn’t hard to see why. Finally, as with all Epilators, you can ­ especially if you’re new to epilation­ certainly expect a few pulls and pinches as you learn to use it. This can’t be avoided though and is the nature of all Epilators. It’s hard to pick apart the product any more than we have done in this Braun Silk Epil 7 review, as for us it is a highly recommended product, and the brand Braun is great in general too. This said, of course, there is always a more premium model out there offering even more, but you’ll always need to pay for that privilege and as far as value for money is concerned, we doubt you’ll have much to be disappointed about.